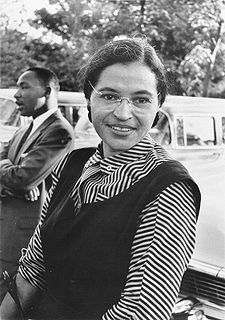 Rosa Parks Day – every day's a holiday! On this day in 1955 a 42 year-old woman in Montgomery, Alabama, made history for something she didn’tdo. Rosa Parks wasn’t the first African-American woman to defy Montgomery’s segregated bus system, but hers was the case that captured America’s attention. Long ago I set my mind to be a free person and not to give in to fear…When I sat down on the bus the day I was arrested, I was thinking of going home…After so many years of oppression and being a victim of the mistreatment that my people had suffered, not giving up my seat–and what I had to face after not giving it up–was not important. I did not feel any fear sitting in the seat I was sitting in. All I felt was tired. Tired of being pushed around. Tired of seeing the bad treatment and disrespect of children, women, and men just because of the color of their skin. After Parks’ arrest, Civil Rights activists Edgar Nixon and Jo Ann Robinson organized a one-day boycott practically overnight. What started as a one-day boycott of Montgomery’s bus system lasted 381 days. A young minister from Atlanta named Dr. Martin Luther King Jr. was elected to head the boycott. Tens of thousands of African-Americans, who comprised the vast majority of Montgomery bus patrons, walked the long road to work or school rather than ride the bus. The following year the Supreme Court deemed Montgomery’s bus segregation unconstitutional in Browder v. Gayle. Parks died on October 24, 2005, just a month before the 50th anniversary of her famous stand–or sit rather. What an important moment that shows the change that one person can influence just by taking a stand for what is right. In the NYT obituary of Odetta today it mentioned that Rosa Parks was once asked what songs meant the most to her and she replied, “All of the songs Odetta sings”. It is interesting to me how so many people paved the way for us today.